In the 2015-16 school year we had our first MYP & PYP visit and introduced teacher inquiry projects as a focus of professional learning. I wanted a Japanese phrase (and kanji) that captures the essence of the project, and which would put it firmly in our own context as an international school in Japan. With the help of colleagues (and most importantly the secretaries) we landed on Tankyuu (探 究). Japanese for inquiry, it means more than just asking a question – it is a quest for learning, a journey. It’s catchy, easy to say, aligns with IB translations and coincidentally by sounding enough like ‘thank-you’ may seed the idea of appreciation, opening doors and encouraging collaboration. In parallel with the individual Tankyuu approach, we spent the year as a school exploring creativity and what it means to be creative at different stages and across the disciplines. We gifted teachers Tony Wagner’s Creating Innovators as a stimulus for discussions and we were fortunate to work with Aloha Lavina in MYP & DP as she helped teachers open up units for more authentic inquiry. The Artist in Residence programme was born, and there were more opportunities to showcase creativity in the community through the year. What is Tankyuu? Click to view the 2017-18 version. With this focus, many teachers chose to focus their Tankyuu project ideas on creative themes in their curriculum and pedagogy. Some were group-led, others were individual. There were a range of themes and ideas, and varying success levels. Although time was set aside in some of the Wednesday PD sessions, it was perhaps not formalised enough (or given enough time) for many busy teachers to make the most of it. The seeds were sown and we decided to build on it the following year. Around this time, in preparation for upcoming work with Ochan Powell, the Leadership Team dug into the book Teacher Self-Supervision. With Shabbi Luthra coming to run a tech audit, we read her book, R & D Your School. Similarly, we had been reading Ron Ritchhart’s Creating Cultures of Thinking and previously had read and discussed Whitaker and Greunert’s School Culture Rewired. Drawing on these sources, we were ready to formalise the permission to innovate and to activate the school’s own culture to drive learning forwards. 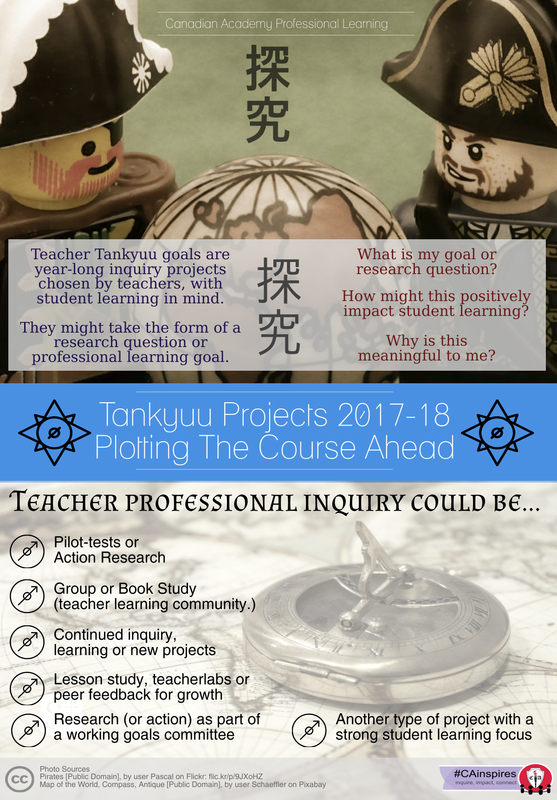 The 2015-16 school year was the first where Tankyuu projects became teachers’ goals, rather than a professional learning supplement. Through ideation in September and refinement with their principals in October, teachers tied their Tankyuu to their goals for the year. This was an attempt to streamline the workload and bring the Tankyuu to the centre of our professional learning strategy. By starting the process as a PK-12 Faculty, collecting initial ideas with GoogleForms and providing some time and space for discussion and refinement of ideas, there formed a range of large group, small group and individual goals. The goals tended to fall under a few themes, often related to whole-school curricular and strategic objectives; examples included some deep dives into mathematics, studies of wellbeing and student stress, reinvention of learning spaces and a continued work on creative inquiry. Some projects continued from the previous year, moving into action phases or deeper research. With John Joseph working with community on the brain, learning and wellbeing, Matt Glover coming in (again) on literacy, Ochan Powell working with various levels of leaders on Cognitive Coaching, Tania Lattanzio working with PYP specialist teachers on curriculum and Ron Ritchhart coming in for Creating Cultures of Thinking, we had a great year of expertise in the school, giving us the raw materials to set goals and the push to improve. As Dr. Ritchhart was working with us in the spring, we realised the importance of maintaining connections between teachers and classes and of teacher-labs (or other forms of collaborative, non-critical teacher-to-teacher observation) in making these inquiries successful. We also evolved the EdTech Team Summit from being a Google-driven, adult-centred event to a (first-outside-the-US) Student Summit. This brought a different kind of energy and expertise and the serendipitous involvement of an alumnus connecting us to makerspace and tools for future work; our eyes (and doors) were opened to many possibilities of future collaborations. As we rounded out the year, we were encouraged and invigorated by the teachers’ reflections and feedback. Tankyuu, though not yet perfect, was starting to become part of “how we do things here”. Canadian Academy Faculty celebrate and sum up their Tankyuu goals for 2016-17 with the Headlines routine and smiling photos. This year, we are using similar structures to last year, but with some key refinements based on the impact of the projects so far and feedback from teachers. As a cycle-diagram enthusiast, I created as Tankyuu professional inquiry cycle to provide more structure for teachers who needed/wanted it. We’re encouraging more connections between teachers across the school and making space for them to learn from and be inspired by each other; or simply to research, discuss and wrestle with ideas together. As we also need to work on school-wide goals, we want to make it easier for teachers to connect their (optional) commitment to working groups to their Tankyuu professional learning goals. They might be involved in R&D for a curricular committee, scheduling working group or get into action research in technology integration, for example. We need to be sure to support effective collaboration between colleagues in pursuit of these goals by providing enough time and resources to make it work: from PD time on Wednesdays to access to incoming experts (Ochan and Ron are back, along with some incoming maths experts), books and online resources, we’re excited to see this year’s outcomes. A Tankyuu Professional Learning Cycle, developed from a Personal Project Cycle, itself derived from the MYP Design Cycle. Find out more about cycles here. This year we kicked off the projects with a range of faculty members sharing their Tankyuu tales as a way to respect, inspire and excite colleagues. There are loads of great projects going on, but here is a small selection to show the diversity of teacher inquiry. A team of Service, Japanese and English Lang & Lit teachers investigated connections between empathy, service learning commitment and success in character-focused tasks in Language & Literature. Elementary and Secondary school music teachers collaborating on aligning skills and techniques through PYP & MYP. Departmental book study leading into classroom action. Investigating Mathematics best practices in Elementary School. Redesigning learning spaces, such as creating an early childhood STEAM lab, or activating the community to build playground features from natural materials. Subject-focused and data-informed interventions to improve specific learning outcomes. Investigating student mindsets and perceptions when taking on challenging problems, or helping develop working efficiencies for learners. Integrating new technologies into a sustainable and creative curriculum. Investigating student data on wellbeing, screentime, homework and stress. These principles are very much emergent, as a result of the last few years’ experience and this year’s plans. Respecting the strong foundations we are building upon; tapping into rather than fighting the school culture. Appreciating the rich diversity of expertise, experience and professional interest among the faculty. Encouraging alignment with touchstones of the school (vision, mission, core values, learning principles, strategic goals etc). Building in time and reasons for effective collaboration within and across natural groups and partnerships. Providing enough support (and options) for teachers to take inquiry in different directions. Recognition of teachers’ efforts and achievements in their Tankyuu inquiry. At this point, some projects, working partnerships or ideas are getting to the point where the teachers involved really could be sharing their stories beyond the school, and I’d like to encourage their involvement in conferences and jobalikes. Our Japanese department have really taken a lead in this regard, and many others are ready. Some projects, including self-directed work on curriculum redesign, investigation into mathematics instruction and work on student wellbeing have been elevated to operational goals for the following year: teacher inquiry is starting to lead the direction of the school. I would love to see the school get to the point where this is the norm in strategic and operational planning; as a culture of thinking becomes our new operating system, it’s be great to see school direction set at all levels of the school. I’m stoked to see how Tankyuu goals progress this year. Although this project has been generally successful, there are some questions I have about the generalizability of the concept. I’ll add more as time goes on. What cultures or regions would be most or least motivated by this approach? How might it connect to or be harnessed for international teacher certification (e.g. this from Lesley Snowball)? Would this work in a school with fledgling (or poorly-performing) teachers? To what extent does character of leadership affect the success of Tankyuu? For example, would it be undermined by authoritative management or high-stakes (high uncertainty) teacher evaluation? If your school is on a similar journey, I’d love here more in the comments (or on Twitter).